Diwali is undoubtedly the festival of colours, lights and rich dishes! Diet and festival don't go hand in hand. And if you are trying to follow a strict diet around the same time, be ready to make some changes for the better. Your positive attitude and determination towards weight loss can make this festival a colorful, fat-free, happy and guilt-free one! 1.Make your food and fitness compatible buddies. 2.Make sure you do not miss your gym classes on the festival day too. 3.Replace your oil and ghee with olive oil. But if it's really necessary to use them, use minimum amounts. 4.Get creative with more salads and its recipes instead of deep fried foods and sweets. 5.Replace honey with sugar and jaggery, but use it in moderation. Try and cut down on the number of sweet dishes. 6.Include more grilled, baked and roasted recipes. 7.Substitute regular milk/rich curd with low fat milk and skimmed curd. 8.Get generous! Distribute the gifts of sweets and chocolates given to you. 9.Eat your meal slowly and don't binge. Eat small, regular healthy snacks like salads to curb your cravings. 10.Do not forget to drink water before you start your meal. Give the choice of gifts a thought before you buy them. Make them as healthy and creative as possible. Diet bars, a box full of assorted nuts, diet books, cartons of fruit/fruit juices can be a healthy choice to make. Try making some low-calorie, low-fat creative recipes this Diwali. Give your diet and health a thought before you pop that sweet into your mouth. 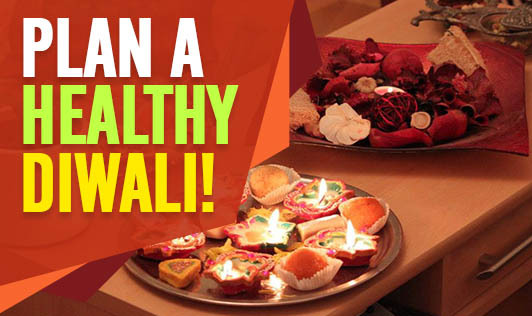 Eat in moderation and enjoy the festival of lights!